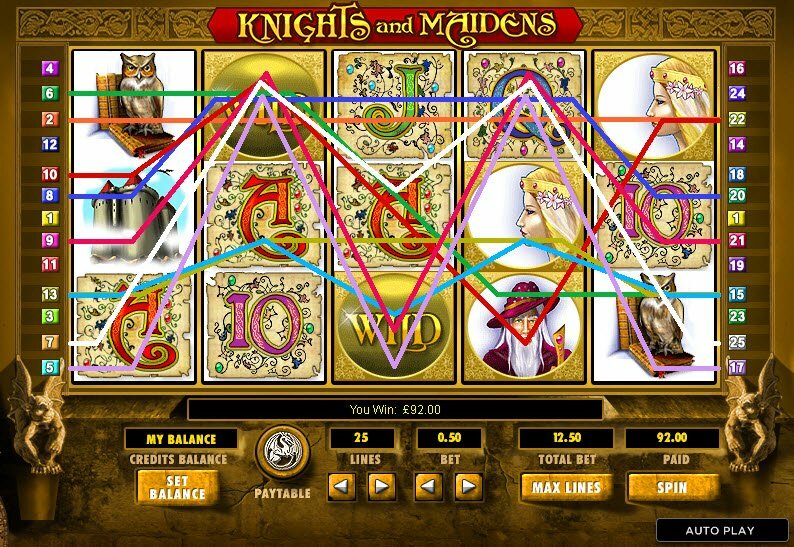 Knights and Maidens combines fairy tales, a notion of magic and medieval times to create the perfect playing ground for you to spin your reels of fortune and see what winning lines will appear. A nifty little bonus game, and plenty of free spins make this a must! As the reels spin, the accompanying music gives the impression of horses frolicking as girls in ball gowns walk carrying those tiny sun umbrellas whilst giggling behind their hands in the days of old. A simpler time, a time of chivalry and women fainting and swooning regularly; needing to be brought to with smelling salts by handsome knights on white horses, out to do nothing more but rescue them. 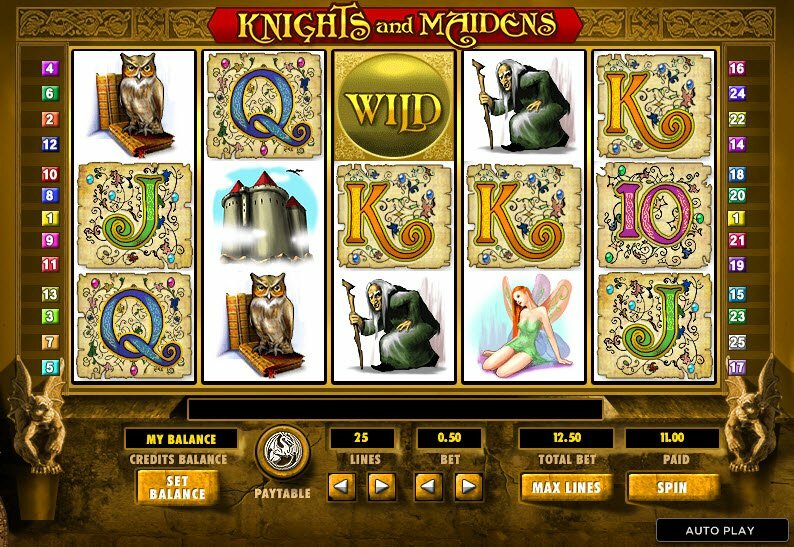 This Knights and Maidens slot game really is a picture perfect slice of fairy tale right in front of our eyes on our screens. Our shiny armoured knight will scatter free spins for you to give you an even better chance of getting those elusive winning payout lines. There is everything from a castle, a stern owl (what fairy tale is complete without one you might ask yourself, and you would be right to!) a fairy striking a pose and a hunched over old wizard, complete with staff. Unless, of course, it is just an oversized wand that helps him to walk around more stably. We have the 10 through to Ace cards with a Middle Ages flavour decorating them, making me think of feasts and pigs with apples in their mouths while a jester sells his jokes, desperately hoping not to have his head cut off for not being funny enough. Here comes the stately, non-wizened old wizard, alert and wearing a royal red as our wild symbol to help substitute for other symbols to increase your potential winning lines. It does not pay out anything itself, and I am sad on behalf of this old wizard that he is not worth anything! 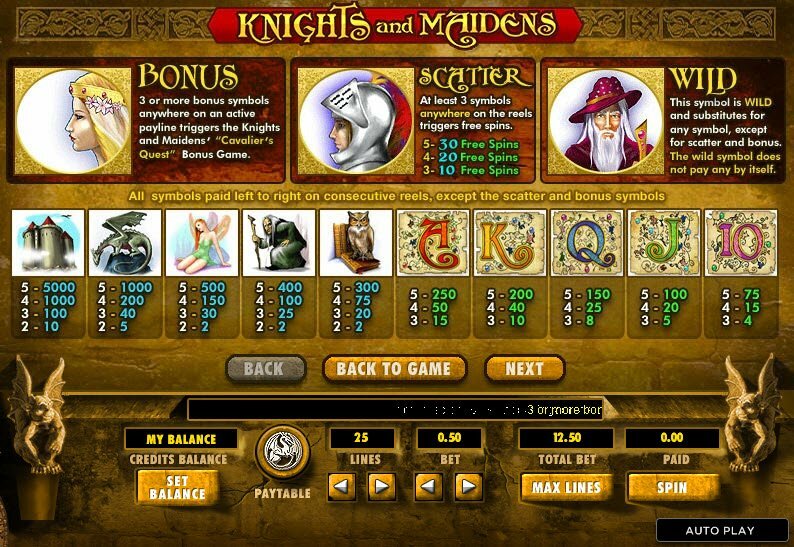 Our Knights and Maidens slot game bonus feature will send you jauntily into the Cavalier's Quest, at the vision of the fairest maiden in the land. You will risk everything to try and save her from the tower and gather your reward, as is fitting of a knight in shining armour.